Government of Karnataka has been making efforts to educate these children by establishing government schools near the forests, when they come for the Mysore Dasara, their children are deprived of schooling facility. Realising this lacuna, for the past few years, the Mysore district administration provides these children with healthcare, schooling and other facilities. A temporary school – called the Tent School - is established every year for their children at the premises where they reside inside the palace ground during dasara period in Mysore. Teachers from government schools would teach them. One of the ardent librarians from MyLISA observed that these children lack library facility in the Tent School. He mooted an idea with MyLISA to think of a library service to reach the unreached. As a result a ‘Tent Library’ was established by the City Central Library of the Department of Public Libraries, Government of Karnataka, Mysore in the premises of the palace where the mahouts reside. The program started on 1st September 2014 and ended on 30th September 2014. The Central Library housed around 800 books of interest to the children. 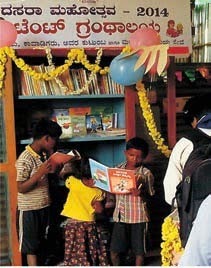 The books were kept on ‘open access’ mode so that children can use the books anytime. During the library hour’ every day, one MyLISA member would visit the school and train the students on various skills such as reading and use of books. Every day, a new kind of book pictorial, newspapers, comics, children’s magazines, maps, atlases, origami books, children’s dictionaries, small biographies, clay art books, wildlife books and others - were introduced to them. 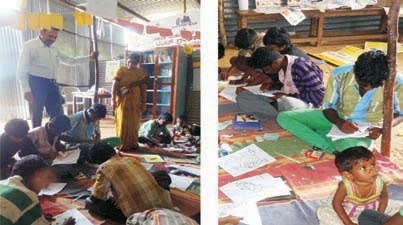 Activity-based trainings in the forms of reading aloud, drawing and painting, handling of books, introducing the anatomy of books, bookmark reparation, clay art and others were introduced. The library was concluded on the last day of the Tent School. It is difficult to quantify the impact of such initiatives right away. However, it is sincerely believed that the program was successful in spreading the book culture through establishment of a library among the children who were deprived of such facilities. Many a time it was a challenge for the resource persons to draw the attention of the children towards reading and use of books. We strongly believe that only persistent efforts will give the results. MyLISA has sowed the beans of book culture in the minds of the tribal children. It is hoped that the tree will grow prosperously in future. MyLISA is also happy to collaborate with Taylor & Francis India to support this endeavour from the next Tent Library session.